Battery watcher and observer for Mac and Linux laptop. print $response . 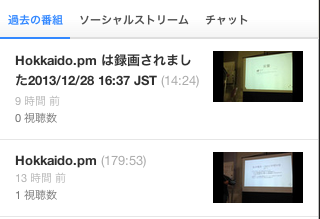 "\n"; # DEBUG? $im->send(APPLICATION_NAME . ": " . $response . " ($hostname)"); # ok either flagged utf-8 or not. Specify watch percents separated by comma. Specify your ImKayac config file path. This file format is YAML format. See below CONFIG FILE SYNTAX section. Default may be 600 seconds. You confirm it by following command. 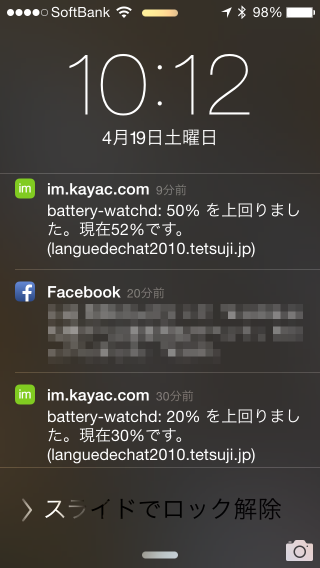 You can give a battery state by ImKayac. So you have to tell this program ImKayac setting. This program gives ImKayac setting file of YAML file. It syntax is same as L<WebService::ImKayac::Simle>'s format. Setting file's path is below "--imkayac-config" section. and some Perl5 core modules. enhancement of “pflog” for parsing maillog of postfix 2.3 or higher version. Perl meets Leap Motion? → なにそれ?